PETER RABBIT never will forget his surprise when Jenny Wren asked him one spring morning if he had seen anything of her big cousin. Peter hesitated. As a matter of fact, he couldn't think of any big cousin of Jenny Wren. All the cousins he knew anything about were very nearly Jenny's own size. Now Jenny Wren is one of the most impatient small persons in the world. "Well, well, well, Peter, have you lost your tongue?" she chattered. "Can't you answer a simple question without talking all day about it? Have you seen anything of my big cousin? It is high time for him to be here." "You needn't be so cross about it if I am slow," replied Peter. "I'm just trying to think who your big cousin is. I guess, to be quite honest, I don't know him." "Don't know him! Don't know him!" Sputtered Jenny. "Of course you know him. You can't help but know him. I mean Brownie the Thrasher." In his surprise Peter fairly jumped right off the ground. "What's that?" he exclaimed. "Since when was Brownie the Thrasher related to the Wren family?" "Ever since there have been any Wrens and Thrashers," retorted Jenny. "Brownie belongs to one branch of the family and I belong to another, and that makes him my second cousin. It certainly is surprising how little some folks know." "But I have always supposed he belonged to the Thrush family," protested Peter. "He certainly looks like a Thrush." "Looking like one doesn't make him one," snapped Jenny. "By this time you ought to leave learned that you never can judge anybody just by looks. It always makes me provoked to hear Brownie called the Brown Thrush. There isn't a drop of Thrush blood in him. But you haven't answered my question yet, Peter Rabbit. I want to know if he has got here yet." "Yes," said Peter. "I saw him only yesterday on the edge of the Old Pasture. He was fussing around in the bushes and on the ground and jerking that long tail of his up and down and sidewise as if he couldn't decide what to do with it. I've never seen anybody twitch their tail around the way he does." Jenny Wren giggled. "That's just like him," said she. "It is because he thrashes his tail around so much that he is called a Thrasher. I suppose he was wearing his new spring suit." "I don't know whether it was a new suit or not, but it was mighty good looking," replied Peter. "I just love that beautiful reddish-brown of his back, wings and tail, and it certainly does set off his white and buff waistcoat with those dark streaks and spots. You must admit, Jenny Wren, that any one seeing him dressed so much like the Thrushes is to be excused for thinking him a Thrush." "I suppose so," admitted Jenny rather grudgingly. "But none of the Thrushes have such a bright brown coat. Brownie is handsome, if I do say so. Did you notice what a long bill he has?" Peter nodded. "And I noticed that he had two white bars on each wing," said he. You cannot mistake him because of his bright reddish-brown coat, long tail and spotted breast. He is black and white with reddish-brown sides, usually on the ground in a thicket. "I'm glad you're so observing," replied Jenny dryly. "Did you hear him sing?" "Did I hear him sing!" cried Peter, his eyes shining at the memory. "He sang especially for me. He flew up to the top of a tree, tipped his head back and sang as few birds I know of can sing. He has a wonderful voice, has Brownie. I don't know of anybody I enjoy listening to more. And when he's singing he acts as if he enjoyed it himself and knows what a good singer he is. 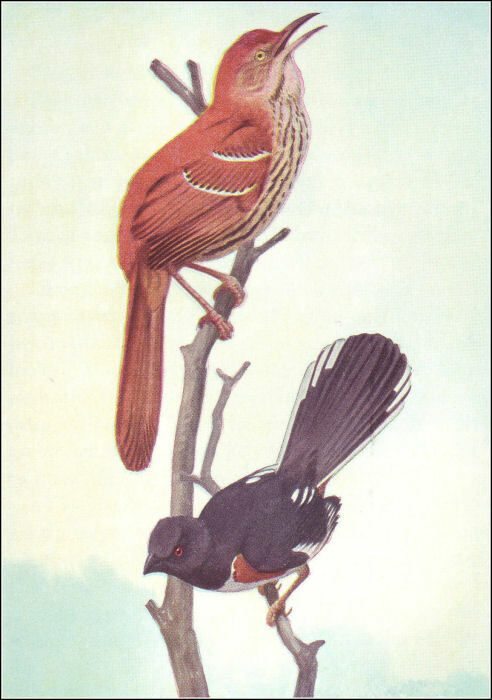 I noticed that long tail of his hung straight down the same way Mr. Wren's does when he sings." "Of course it did," replied Jenny promptly. "That's a family trait. The tails of both my other big cousins do the same thing." "Wha-wha-what's that? Have you got more big cousins?" cried Peter, staring up at Jenny as if she were some strange person he never had seen before. "Certainly," retorted Jenny. "Mocker the Mockingbird and Kitty the Catbird belong to Brownie's family, and that makes them second cousins to me." Such a funny expression as there was on Peter's face. He felt that Jenny Wren was telling the truth, but it was surprising news to him and so hard to believe that for a few minutes he couldn't find his tongue to ask another question. Finally he ventured to ask very timidly, "Does Brownie imitate the songs of other birds the way Mocker and Kitty do?" Jenny Wren shook her head very decidedly. "No," said she. "He's perfectly satisfied with his own song." Before she could add anything further the clear whistle of Glory the Cardinal sounded from a tree just a little way off. Instantly Peter forgot all about Jenny Wren's relatives and scampered over to that tree. You see Glory is so beautiful that Peter never loses a chance to see him. As Peter sat staring up into the tree, trying to get a glimpse of Glory's beautiful red coat, the clear, sweet whistle sounded once more. It drew Peter's eyes to one of the upper branches, but instead of the beautiful, brilliant coat of Glory the Cardinal he saw a bird about the size of Welcome Robin dressed in sober ashy-gray with two white bars on his wings, and white feathers on the outer edges of his tail. He was very trim and neat and his tail hung straight down after the manner of Brownie's when he was singing. It was a long tail, but not as long as Brownie's. Even as Peter blinked and stared in surprise the stranger opened his mouth and from it came Glory's own beautiful whistle. Then the stranger looked down at Peter, and his eyes twinkled with mischief. "Fooled you that time, didn't I, Peter?" he chuckled. "You thought you were going to see Glory the Cardinal, didn't you?" Then without waiting for Peter to reply, this sober-looking stranger gave such a concert as no one else in the world could give. From that wonderful throat poured out song after song and note after note of Peter's familiar friends of the Old Orchard, and the performance wound up with a lovely song which was all the stranger's own. Peter didn't have to be told who the stranger was. It was Mocker the Mockingbird. "Oh!" gasped Peter. "Oh, Mocker, how under the sun do you do it? I was sure that it was Glory whom I heard whistling. Never again will I be able to believe my own ears." Mocker chuckled. "You're not the only one I've fooled, Peter," said he. "I flatter myself that I can fool almost anybody if I set out to. It's lots of fun. I may not be much to look at, but when it comes to singing there's no one I envy. "I think you are very nice looking indeed," replied Peter politely. "I've just been finding out this morning that you can't tell much about folks just by their looks." "And now you've learned that you can't always recognize folks by their voices, haven't you?" chuckled Mocker. "Yes," replied Peter. "Hereafter I shall never be sure about any feathered folks unless I can both see and hear them. Won't you sing for me again, Mocker?" Mocker did. He sang and sang, for he clearly loves to sing. When he finished Peter had another question ready. "Somebody told me once that down in the South you are the best loved of all the birds. Is that so?" "That's not for me to say," replied Mocker modestly. "But I can tell you this, Peter, they do think a lot of me down there. There are many birds down there who are very beautifully dressed, birds who don't come up here at all. But not one of them is loved as I am, and it is all on account of my voice. I would rather have a beautiful voice than a fine coat." Peter nodded as if he quite agreed, which, when you think of it, is rather funny, for Peter has neither a fine coat nor a fine voice. A glint of mischief sparkled in Mocker's eyes. "There's Mrs. Goldy the Oriole over there," said he. "Watch me fool her." He began to call in exact imitation of Goldy's voice when he is anxious about something. At once Mrs. Goldy came hurrying over to find out what the trouble was. When she discovered Mocker she lost her temper and scolded him roundly; then she flew away a perfect picture of indignation. Mocker and Peter laughed, for they thought it a good joke. Suddenly Peter remembered what Jenny Wren had told him. "Was Jenny Wren telling you the truth when she said that you are a second cousin of hers?" he asked. Mocker nodded. "Yes," said he, "we are relatives. We each belong to a branch of the same family." Then he burst into Mr. Wren's own song, after which he excused himself and went to look for Mrs. Mocker. For, as he explained, it was time for them to he thinking of a nest.